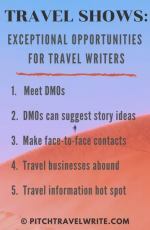 Making travel writing decisions about a potential travel story or destination, and its “publishability” is one of the most important skills for a travel writer. If the cards are stacked against a story, you must know when to walk away. 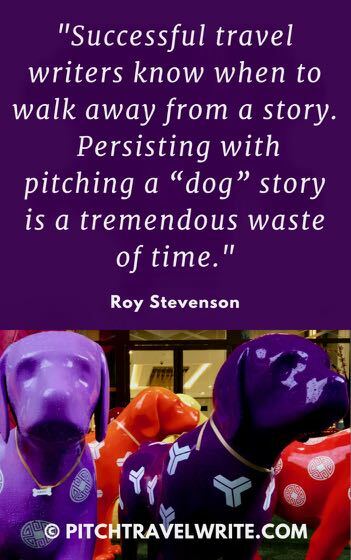 Persisting with pitching a “dog” story is a tremendous waste of time. Some travel articles are doomed to never see the light of day. Such ill-fated stories can be victims of circumstances, poor timing, questionable ethical and moral issues, or just plain bad luck. The same advice goes for destinations. Some are simply too controversial or downright dangerous to visit. A writer I’m coaching wanted to pitch a story about the wineries in the Sonoma, California area. This was the spot ravaged by sizeable fires in 2017. I had mixed feelings about pitching this one. Magazine editors generally are not interested in "downer" stories. They prefer upbeat, exciting, feel-good stories that excite their readers. Wine tasters want to inhale the aroma of a fine merlot in a boutique tasting room. They don’t want to see and smell scorched wastelands. What happened in Sonoma County is a tragedy. Although this might be interesting “news”, wine magazine editors and their readers know the area will not be suitable for wine-tasting tourism for some time. As I write this, I notice some wineries have launched a marketing campaign to let the public know that they are open for business. However, tourists tend to stay away from areas where there have been tragic incidents. No one wants to visit a place ravaged by fire, floods, earthquakes, volcanoes, piracy, genocide, disease, or any other man-made or natural catastrophes. People are picky when it comes to choosing a vacation destination! You’re wondering why I had mixed feelings, right? 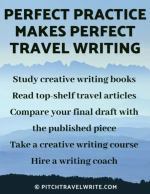 There's a lot involved in making these travel writing decisions! All was not lost with this story idea. In a few months, wine magazine editors will be interested in an update. They’ll want to know how the Sonoma wineries are recovering from the fires. They’ll be looking for good news stories. I suggested the writer place this story on the back burner and gather some facts about the recovery of the wineries. Although it’s on hold right now, they can query this story in a few months’ time when things are on the upswing. 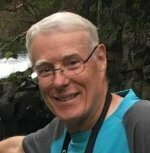 One writer I coach lives in Turkey. She clearly loves the place and the people. And she desperately wants to write about the places she visits. However, in 2017, Turkey stopped accepting visa applications from American citizens. Clearly, there is no point in pitching travel stories about Turkey to American media. One of my travel writing journalist friend suggests this writer pitch her stories to the other English-speaking travel media (U.K, Australia, Canada, New Zealand). This is sound advice. Keep in mind, cutting the U.S. travel media from your magazine distribution list will limit the statistical chances to get your story published. Ultimately, this travel writing decision is up to the writer and the outlets they pitch. A few months ago we were offered a tempting five-day press trip. We’d cruise around Myanmar’s Mergui Archipelago, and drop anchor at beautiful, remote white sandy bays. We’d snorkel with colorful marine life through warm, clear water. Our home for most of the trip would be the MV Sea Gypsy, a classic converted fishing boat with canvas-sided cabins. We’d also stay in a beachfront bungalow at the Boulder Bay Eco Resort. We’d meet sea gypsies and kayak around deserted coves. There would be sunrise and sunset photo shoots of this paradise. But there was one big problem. I couldn’t sell a story. Travel editors aren’t buying stories about Myanmar. Myanmar is on the tourist “no-go” list because of their persecution of the Rohingya. Travel writing decisions are simple when something is obvious. In the end, we cancelled out of the press trip. I don’t accept press trips if I can’t sell at least one story in advance. Sure, we could have taken the trip and quietly disappeared into the sunset. But that’s not ethical, and it’s the reason for my policy. Now and then you have to make a hard decision in the travel writing game. This was a tough one! Some places aren’t worth visiting, no matter how much you’re intrigued by the place. These travel writing decisions are a slam-dunk. Anyone wanting to visit North Korea needs to be sternly reminded that this unsavory country is run by an overindulged madman. He has no restraints on what he can and can’t do. The recent case where 21-year old American student, Otto Warmbier, was arrested by their secret police for stealing a poster off a wall. He was sentenced to 15 years’ hard labor for this heinous offence. It’s only one example of a hapless American citizen being brutally used as political pawn. Warmbier, you might recall, was flown back to the U.S. in a coma, and died soon after. He paid a steep price for his decision to travel there. Sometimes you have to wonder how people make decisions when hosting travel writing and blogging conferences. For example, after learning that the 2018 Travel Blogger’s Exchange (TBEX) would be hosted in Zimbabwe, travel blogger Kate McCulley wrote a searing expose of why this decision smells. Her well-written and heartfelt plea not to attend the TBEX in Zimbabwe clearly states the problems with attending a conference in this volatile dictatorship. Kate puts the case a lot better than I can, so here’s the link to her article. Well, where does all this mayhem leave us and making travel writing decisions? There are plenty of politically stable destinations around the globe that are safe to visit, and that have great tourist attractions and activities. Perhaps we should be writing about those countries instead of touting political flashpoints? Make sound, ethical travel writing decisions. Don’t place yourself where things can go tragically wrong at any moment. You can check with the U.S. Department of State website for Travel Warnings and Travel Alerts about the situations in countries you’re considering visiting. Also, check the CIA website for updates on the political situations and general background in countries you’re considering visiting. The gambler’s advice applies to you when deciding what stories to pitch and where to visit. When in doubt, walk away from bummer stories and run from conflicted destinations.